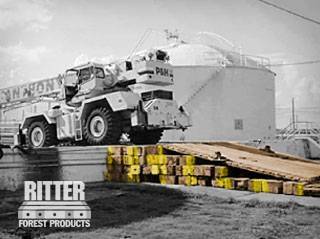 At Ritter Forest Products, we are committed to helping you make your job site as safe and efficient as possible. We offer crane mat sales and rentals in Virginia that will allow you to maneuver cranes and other industrial equipment around without having to worry about it sliding or sinking into the ground. We also have pipeline skids for those companies that need help building pipelines. Our products will make life easier on you and your employees and maintain a safe working environment at all times. 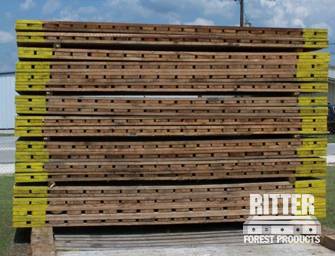 Ritter Forest Products has thousands of hardwood crane mat sales and rentals in stock at any given time in Virginia. We carry a wide range of sizes and have crane mats made out of many different materials. But we are also capable of creating a custom mat and timbers for you that will fit your specific applications. We will build and deliver your custom creations so that you can start using them right away. Whether you plan on using a single crane on a job site or a variety of heavy machinery, you should put down crane mats in Virginia to give you a nice level surface to work on at all times. Ritter Forest Products has crane and timber mats rentals in Virginia that will help you move equipment around without damage the equipment itself or the surrounding area. Mats can come in handy when working on uneven surfaces or surfaces filled with potholes, bumps, and other imperfections. If you choose to try and operate heavy-duty equipment without the use of timber mats in Virginia, you could put your employees at risk. You could also damage whatever it is you’re working on and make your job harder than it has to be. Ritter Forest Products has laminated and timber mats for rent that will help you avoid these scenarios. Our timber mats are strong and stable and will stand up to any challenges you face. Whether you want to build a temporary road for moving equipment or you need a stable platform for a single piece of equipment, you can get the job done with 3-ply laminated mats in Virginia from Ritter Forest Products. Our 3-ply laminated mats are made using 2x8s and can be moved from place to place easily. You can also attach cables and chains to them to use them for lifting purposes. During particularly heavy lifts or intense jobs, you might want to stabilize your equipment more than usual. You can do it with outrigging pads that will provide you with additional balance and support. You can also use transition mats from Ritter Forest Products for moving equipment from the ground level to an elevated surface. When you’re building a pipeline in Virginia, you should utilize pipeline skids/timbers in Virginia. They will assist you with cribbing, racking, and elevating the pipes you will be using along the way. They will prevent pipes from falling and allow you to work more efficiently as you move down the pipeline. 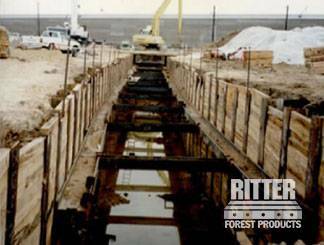 In addition to providing you with Virginia hardwood crane mat sales and rentals, Ritter Forest Products can also provide you with Shoring material/cribbing that will offer support to temporary structures and walls and even your heavy equipment. Our shoring and cribbing materials are durable enough to stabilize almost anything from all angles. 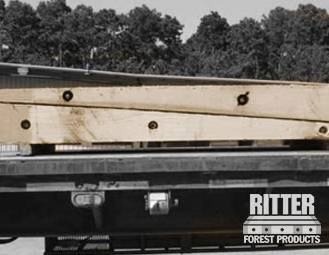 To learn more about our laminated and timber mats for rent, our pipeline skids for sale, or any of our other products that are available in Virginia, give Ritter Forest Products a call today to get all the information you’ll need to make an informed decision.